I have taken many cards from Doreen Virtue’s Daily Guidance from your Angels deck. Putting them all together I am being guided in the direction, that you have been asking for help with a situation and your angels and guides have been working with you on it, from the very beginning. This means from even before you incarnated into this life, because it is part of your life purpose. They say that you have been having thoughts and ideas about this and it is safe to move forward on with them. They want you and others to have joy in your life, it is a high vibration and everyone deserves to feel it. This is also about treating others as you would like to be treated, with love, caring and respect and at the same time, having love, care and respect for yourself, bringing everyone to a softer, gentler, more joyful way of being. This amazing card arrives again - New Partner and it has the picture of Pegasus on it. 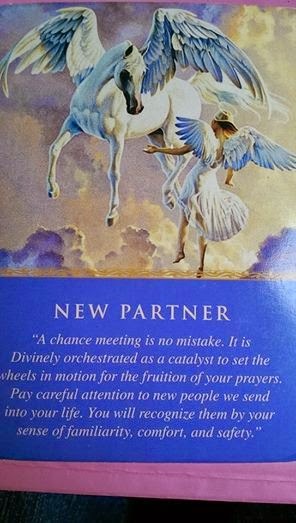 If you have been following my readings you will see that I had been seeing this card and then out of the blue, a trailer was parked outside my house with a digger on it which had the name Pegasus on it. So, this reading is about new people coming, or who have already come into your life, who are very important in the bigger picture of your life purpose. Each of you will know what you have been asking about and working on. So it is another week of communication and forward movement. Watch out for the signs and synchronicities and trust your intuition on the next steps you are guided to take. Your angels, guides and loved ones are with you all the way. What I want to do now is just pop the text of each card here for you, as many of you like to see the original message. ASK us to help you in this situation, and we will immediately go to work on your behalf. We’re governed by many universal laws, and among them is the free will that allows you to make your own choices and decisions. So we patiently await your request. (our angels cannot act until we ask for their help). GO FOR IT – your prayers and positive expectations have been heard and answered. We’ve been working with you on this situation since its genesis, and we continue to watch over you and everyone involved. Stay on your present path, as it will take you very far indeed. TRUSTWORTHY GUIDANCE – You’ve received a wonderful idea as an answer to your prayers. This idea is real and trustworthy. You can safely move forward with it, knowing that we are with you every step of the way. Ask for and be open to receiving our support for anything that you need related to this idea. NEW PARTNER – A chance meeting is no mistake. It is Divinely orchestrated as a catalyst to set the wheels in motion for the fruition of your prayers. Pay careful attention to new people we send into your life. You will recognize them by your sense of familiarity, comfort and safety. JOY is the highest energy of all. It’s the magical sense that everything is possible. Joy springs from appreciating the gifts within each moment. Joy allows you to attract and create your present and future moments at their highest possible levels. ACCEPTANCE – see yourself and others through the eyes of the angels, with unconditional love and acceptance. In this way, you inspire and lift everyone to their highest potential.